Dairglen have been supplying retailers with real dairy ice cream since 1991. In 2005 Dairyglen launched the Smooch ice cream brand to retailers and has since become the No. 1 Soft Serve Ice Cream solution in Ireland today. 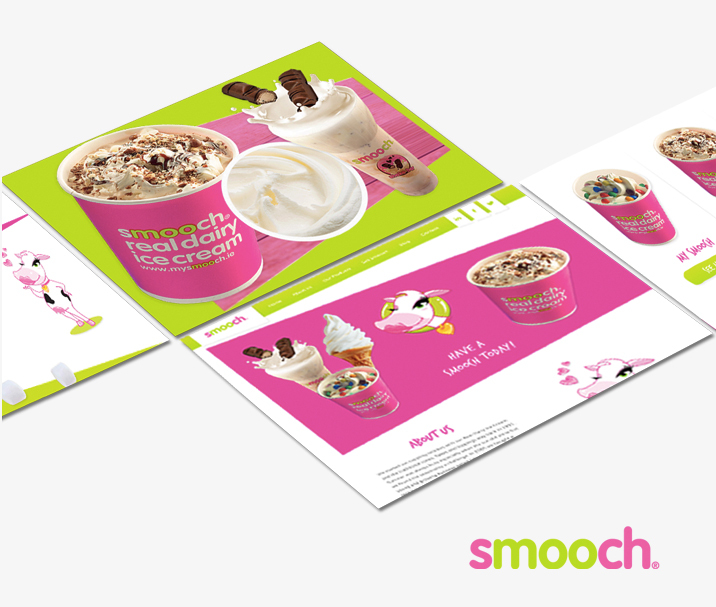 Smooch needed a digital partner that could help portray the brand accurately online. T2 developed the new website paying careful attention to enhancing the Smooch brand. The website is designed to be playful and interesting, wetting peoples appetite for a soft serve, whilst also assisting browsers to find their nearest store. T2 are also helping Smooch shape their multichannel strategy to be a unique, rich and interactive online brand experience. Philip Delaney, CEO Dairyglen, explains: “As part of our wider brand strategy, Smooch needed to update their online brand image to be more reflective of our offline product and ethos. As the No. 1 Soft Serve Ice Cream solution in Ireland, Smooch needed to partner with a digital agency that could work closely with us in order to implement an online presence that captured the attention of our core consumer audience – and which also reflected our product offering to the retail market. T2 did just this – through close consultation and regular reviews they gained an understanding of our business objectives, the wider market and user demographics, culminating in the production of both a website and wider digital strategy that aimed to drive increased awareness and ultimately sales in both the consumer and retail environments.